Atlantis has been the stuff of legend for decades. Imagine, an entire continent, an entire civilization that sunk into the sea in a cataclysmic disaster thousands of years ago. Historically unverifiable, this mythical land raises fascinating implications in today’s uncertain climate, both socially and globally. The Atlanteans is a spellbinding novel that deals intriguingly with just these questions. The drama begins when Teddy Townsend, a lawyer, and Ryan Stuart, a brilliant neurosurgeon, enter Teddy’s yacht, the Lady Leah, in a race from Miami to Nassau. That night, they become lost in a violent, mysterious storm. The following morning, still lost, Teddy and Ryan discover an island mostly composed of jagged rocks, and meet the mysterious, wraithlike Polaris, who, in an ancient chamber, introduces himself as a Magi of Atlantis. He warns them that mankind has reached a precarious stage in its development, and that consequences will be severe if it continues down its present path. Things get even stranger when Polaris shares with them a vision in which they view the adventures of two young men who have a lot in common with the yacht racers. As the vision progresses, Teddy and Ryan realize that they are the reincarnations of these two Atlantean characters. Horrified, they witness the sinking of the continent, the lives of multitudes snuffed out due to the machinations of a Hitler-like, evil magician named Merak. After the Lady Leah is rescued, Teddy and Ryan read a newspaper article about an international committee of bankers with an accompanying photo of someone who looks suspiciously like Merak walking up the White House steps with the President of the United States. Merak’s plans to destroy the world are beginning to take hold, and it falls to Teddy and Ryan to defeat him before it’s too late. Author Dorothy Cora Moore has created a suspenseful, fun-filled and interesting story in The Atlanteans. Although the plot takes a little while to set up, the story’s pace accelerates once Teddy and Ryan return home to Chicago and decide to take a stand against Merak. The relationship between the extremely neat and uptight Ryan and the more laid-back, family man Teddy is at once touching and hysterical. Add in Teddy’s slightly eccentric family, and the mysterious Mr. Chang, an investigator hired to help them solve the mystery of the current identity and whereabouts of the elusive Merak, and The Atlanteans takes off. Aficionados of legends will find the blend of humor, suspense and mythology to their liking. The reader will love Teddy’s family, and it is the author’s gift that she makes the reader feel related to a unique and intelligent clan. The Atlanteans’s strong plot, interesting and sympathetic characters, and a storyline rich with the arcane legends of a lost civilization, are guaranteed to keep the reader’s interest well afloat. Regular Bull! 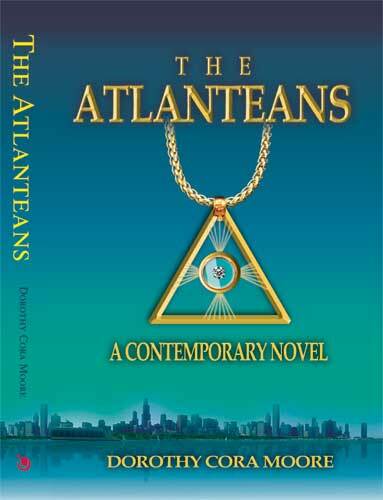 Not bull reader, author and friend Dorothy Cora Moore has just published an exciting new novel, The Atlanteans. Packed with mystery, prophesy, adventure and ageless wisdom, it is a fast-paced story with a valuable message for our troubled times. The Mystery Schools of China and Greece, and the Temple Schools of Egypt have in common a teaching called the Ageless, or Ancient Wisdom. These teachings date back to the mysterious empire known as Atlantis, an ancient island continent at the pinnacle of technological and civil development that was destroyed some 25,000 years ago. It was foretold that a large mass of land, equal in size to old Atlantis, would be protected and set-aside in the future, preserved and awaiting the return of its former citizens. When the time was right, the call would go out by the Watchers of the race and the souls of Atlantis would reassemble in that special place. Some believe that place to be America. Edgar Cayce, known as the "Sleeping Prophet" gave over 14,000 readings between the years 1901 and 1945, covering more than 10,000 topics. Among these, no less than 700 concerned the topic of the antediluvian civilization known today as Atlantis. Cayce saw visions of a continent that reached the peak of technological and civil advancement, but which then saw the disintegration of its culture through greed and lust. Before the legendary land disappeared under the sea, there was an exodus of many Atlanteans through Egypt and further a field. Cayce attributed history's Great Flood in part to the sinking of the last huge remnants of Atlantis. It is believed that the Atlanteans, having lost an earlier opportunity, have waited in time until an entire cycle of ages had passed before they could come together once more to fulfill their destiny - a destiny of bringing in a new and prosperous age, reestablishing peace, harmony, and tranquility to a troubled planet and, once again, restoring the Kingdom of God on Earth. "America is the last great hope for mankind, and she has yet to complete her destiny. Humanity has been experiencing the Piscean age for about 2,000 years. We are currently cusping the Aquarian Age, which was inaugurated by the discovery of electricity. The year 2000 marked the formal end of the Piscean Era, and your people have yet to redirect those who have lost their sense of decency and render harmless those others who are misusing their power." While Atlantis is a peaceful place, there are evil forces at work. A certain Atlantean black magician, Merak, is motivated by individual greed and power to take actions that ultimately lead to the ultimate destruction of the entire civilization. Teddy and Ryan witness this destruction, and witness the roles that they played in their former lives in Atlantis. As Atlantis is destroyed, they are returned to Miami, pondering the meaning of their experiences. It is on their long flight back home that they realize what has happened. Just as they have been reincarnated from Atlantis to present-day in America, the same is true for Merak. Events and characters from these two great civilizations separated in time are about to clash once again. The newspaper headline reads, "PRESIDENT TO MEET WITH INTERNATIONAL COMMITTEE OF BANKERS, BUSINESSMEN AND INDUSTRIALISTS TODAY ON WORLDWIDE ECONOMIC CRISIS." Below the headline was a picture of Merak, walking up the steps to the White House with the President of the United States. Teddy and Ryan realize their mission. They failed to stop Merak in their previous lives and Atlantis was destroyed as a result. This time they are determined not to waste the opportunity, lest America suffer the same fate as Atlantis and is lost forevermore.